The Palestinians attempt to de-legitimize the Jewish connection to Israel, Jerusalem and the site of the two holy temples to God, is continually supported by US President Obama, Secretary of State Kerry, much of Europe. Part of of the Palestinian attempt to destroy the Jewish State to call into question any historic association between Jews and the land which is why they are trying to remove any claim Israel has to Mount Moriah, the Temple mount and Jerusalem the city it sits in. They forget that in their ancient texts the ancient Greeks, Romans, even the ancient Muslims reported thate Jerusalem and Temple Mount were Jewish lands. Lets start with the most recent of times. 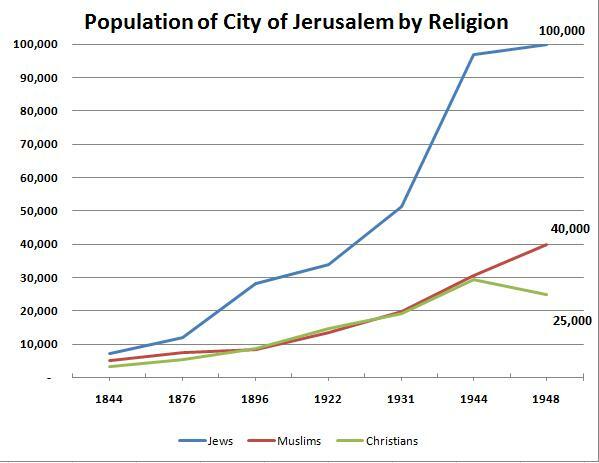 The Chart below details the population of Jerusalem by religion from 1844-1948. Source: Manashe Harrel, "The Jewish Presence in Jerusalem through the Ages" in Sinai and Oestericcher, eds., Jerusalem, John Day, 1974. Jews were the majority of the Jerusalem Population from 1844 through the establishment of the State Of Israel when they were kicked out by Jordan. 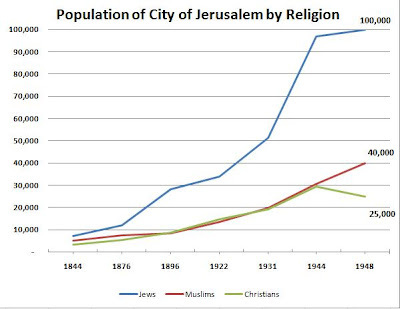 From 1948-1967 Jerusalem was occupied territory-- In fact Muslims were the third largest religion in the city until about 1890. The historically proven Jewish tie to Jerusalem starts way earlier than the mid 19th century. After the Bar Kochba revolt in 135 CE the Romans punished the Jews for revolting again by changing the name of their country from Judea (after the Tribe of Judah which is where the term Jewish Came from) to Syria Palaestinana, after the Philistines the ancient Jewish Enemy who according to page 313 of the Oxford encyclopedia of archaeology in the Near East, had disappeared in the late 5th century B.C.E.. At the same time the Romans changed the name of the holy city from Jerusalem to Aelia Capitolina (literally Capitoline Hill of the House of Aelius) most of the world recognized the Holy Land and Jerusalem as Jewish. Why this is important is that some Palestinians say they are descended from the Philistines but history tells us those people were absorbed into Babylonia and Assyria almost six centuries before the name of Judea was changed by the Romans. For ancient Greek and Roman pagan authors, Jerusalem was a Jewish city. An examination of their texts indicates the unanimous agreement that Jerusalem was Jewish by virtue of the fact that its inhabitants were Jews, it was founded by Jews and the Temple, located in Jerusalem, was the center of the Jewish religion. In an account by Hecataeus of Abdera (c. 300 BCE approximately 1,500 years after the Exodus), Jerusalem appears toward the conclusion of his counter-Exodus account and before his description of Jewish society and practices. He attributes the expulsion of the Jews to the pestilence which the Egyptians blamed upon the presence of foreigners, not only Jews, who caused the natives to falter in religious observance. "Therefore, the aliens were driven from the country." While some went to Greece, most "were driven into what is now called Judaea ... at that time utterly uninhabited ... on taking possession of the land, he [Moses] founded, besides other cities, one that is the most renowned of all, called Jerusalem. In addition, he established the temple that they hold in chief veneration, instituted their forms of worship and ritual, drew up their laws and ordered their political institutions." 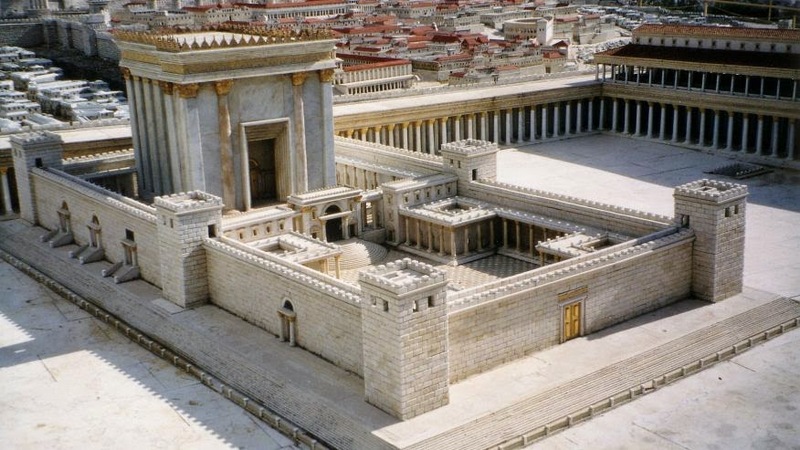 And in his account of Titus' siege of Jerusalem, Tacitus describes the Temple as "... built like a citadel, with walls of its own ... the very colonnades made a splendid defense. Within the enclosure is an ever-flowing spring. "[Tacitus, Historiae V:12:1 (Stern, II, XCII, no. 281) 22,30. In addition to physical descriptions, the authors mention the religious aspect of the Temple which differed radically from Greek and Roman paganism. In the text preserved by Diodorus, Hecataeus mentions the priests and their duties in the Temple and even describes a worship service and sacrifice. Similarly, the first century Roman historian Livy remarks that the Jews do not state "to which deity pertains the temple at Jerusalem, nor is any image found there, since they do not think the God partakes of any figure. "Hecataeus, in Diodorus, Aegyptiaca, Bibliotheca Historica XL, 3, 4-6; Stern, I, V, No. 11, 26-28. All of this happened between 500-1,000 years before Islam was founded by the Muslim prophet Mohammad. There is even a Koranic passage which indicates that Jerusalem might not be so holy to Muslims, and is passed on to the Jews "
"...They would not follow thy direction of prayer (qiblah), nor art thou to follow their direction of prayer; nor indeed will they follow each other's direction of prayer..."
Commentators explain that "thy qiblah" (direction of prayer for Muslims) clearly refers the Ka'bah of Mecca, while "their qiblah" (direction of prayer for Jews) refers to the Temple Mount in Jerusalem. The 13th-century Arab biographer and geographer Yakut noted: "Mecca is holy to Muslims, and Jerusalem to the Jews." Muslim tradition holds that it was built deliberately on the verified site of earlier sanctuaries. According to Muslim tradition, when the Caliph Umar visited Jerusalem after its conquest, he searched for David's sanctuary or prayer niche (mihrab Dawud), which is mentioned in the Qur'an (38:21). (David was believed to have chosen the site on which Solomon built.) When Umar was satisfied he had located it, he ordered a place of prayer (musalla) to be established there. This evolved into a mosque-precursor of the later Aksa Mosque. Thus began the Islamization of the complex that later came to be known as the Haram al-Sharif. It became the tradition of Islam that Muslims restored the site to its earlier function as a place of supplication venerated by all the prophets, including Abraham, David and Solomon. Today the Muslim world, led by President Obama's buddy the "moderate" terrorists Abbas, claims Jerusalem as theirs only as a straw dog to further de-legitimize the Jewish hold on the Holy Land. Sadly the President and Secretary of State of Israel's best friend the United States supporting Abbas' claim by constantly criticizing Israel's claims on the Holy City and the Holiest site in all of Judaism. They criticize Israel's claims because they understand even more than some Jews, that Israel is the heart of the Jews, Jerusalem is the heart of Israel, and the Temple Mount is the heart of Jerusalem. Rip out the heart and the body will die.